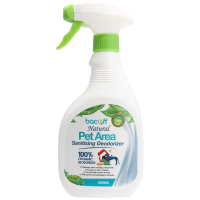 Keep your pet's area clean without worrying about chemical residue that can be ingested by their curiosity. Made from 100% Food Grade Ingredients, it is safe for use in the presence of your pets or family members. Putting the hurt on dirt – the natural way. No toxic residue produced during use. Made from 100% Food-Grade Ingredients and safe for the environment. Totally biodegradable! Bioflavonoids, Lauryl Glucoside, Sodium Gluconate, Lemon Essential Oil and Pure Water. Spray directly on any hard, washable surface and wipe clean. Repeat and agitate for stubborn stains. For a deeper clean, remove soiled bedding and material before clean. Use in conjunction with Pet Area Cage, Litter Tray & Toy Sanitizer for a complete clean and refresh.